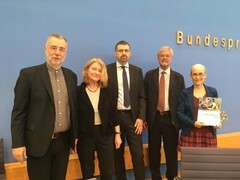 On 7 June the Friedensgutachten (Peace Report), funded by the German Foundation for Peace Research (DSF) and published by the five major German peace research institutes, was presented in Berlin. 60 million people worldwide are displaced. More than one million have found refuge in the European Union. The main topic of this year’s Peace Report “Focus on the causes of displacement. Assume responsibility!” is the largest refugee movement since the end of the Second World War: its meaning for humanitarian issues, its political consequences for the European Union and the testing times for politics and society alike. The editors of the Peace Report 2016 call for German politicians to assume responsibility in the fight against the causes of displacement and in creating politics based on solidarity.